In a recent Bunts Convention at Mysuru, I was intrigued by a photograph of many women wearing a typical Udupi flower, ‘sooji mallige,’ a unique flower with a distinct fragrance. Even the way this flower is worn by women is special. Quite expensive but available in Mysuru too, thanks to the unofficial courier service of Durgamba and other night bus service. Hundreds of items like food and fresh vegetables are transported by these bus services across the cities, a yeoman service indeed and much cheaper and faster than the regular courier service! Udupi for long has been associated with vegetarian cuisine. The masala dosa has been internationally acclaimed as must have dish before one dies ! Of course, the founders of two major vegetarian hotel chains, Woodlands and Dasprakash Group claim that masala dosa has been invented by them! The humble dosa has been fusioned and about 100 varieties of dosas are available in the market. Noodle dosa, pizza dosa, badam halwa dosa and some enterprising people have started the non-vegetarian variety too. For example, keema dosa, chicken tikka dosa. I am not sure who is the real inventor of this dish but he must be definitely turning in his grave in disgust at the confusion in the name of fusion. The humble idli [two States, Tamil Nadu and Karnataka claiming that they have invented this has been declared as the healthiest and safest food for patients all over the world by WHO. Folklore has it that Udupi had been blessed by Lord Krishna to be the caterers of the world since Udupi Cooks took care of the catering of Mahabharata war. How much of this is true? Your guess is as good as mine. Of all the avatars of Lord Vishnu, why Krishna is the reigning deity of Udupi? Could not find a satisfactory answer. How this city got its name? Well, “Udu” means Stars and “Pa” means the Lord. Since the Moon is considered the Lord of the Stars, the town got its name as Udupa, which now has become Udupi. A popular folklore story: The Moon was once cursed by one of the sons of Brahma, Daksha Prajapathi, the King of the Earth. Moon performed a penance to Lord Shiva, who pleased by his penance appeared before him and freed him from the curse. Udupi is the place where Moon is supposed to have performed his penance and got the blessings of Shiva. That is the reason Lord Shiva, also known as Chandramouleshwara, has his temple next to the main deity of Lord Krishna. Another popular belief is that Udupi has been created by Sage Parashurama and not Vishvakarma. Hence, majority of the population are Brahmins in this town and the pujas done following all rituals. Another unique feature of this town is the free lunch provided to all devotees every day. Approximately 2,000 people are fed in three halls inside the temple. Pure vegetarian, “sattvic” food is served. What is sattvic? Well, sattvic cooking is based on ayurveda and yoga literature. Meaning “sattva” [quality]. In this system, those foods having energy increasing capacities are called “rajasic” and those food which decrease our energies are called “tamasic.” Locally grown seasonal vegetables and fruits, whole grains, unpolished lentils etc., are used. It is also a fact that there are some unique and distinct vegetables grown in this area like ladies finger, southe [a type of cucumber], alasande, kempu arave [a red spinach], gulla [a variety of brinjal]. They just taste different. Wholesome quality food, just like the langars in up North, this free meal is offered by the temple Mutts to the general public with generous donations from the devotees. A typical Udupi food is fiery red in colour because of a typical chilli called byadige menasu. The cooks add a little of guntur chilli to make it little spicy. The food is also typically sweetish because of liberal use of jaggery. Coconut, of course, is liberally used in all the dishes. When in town, do not miss the famous goli bajje of the Mitra Samaja, a small restaurant near the temple. For breakfast, many a restaurants serve the famous moode, a variation of idli, a local speciality. There is a very famous restaurant called Diana at Udupi, owned by one Mohandas Pai. It is said that one day his chef, due to shortage of a variety of ice-cream, concocted a dessert called ‘gadbad’ using 3 scoops of assorted ice-cream, jelly, dry fruits, in a large glass and gave to his guests. Just like the famous Mysore pak, a freak invention, this was so much liked by his guests, Pai decided to put it in the menu. Now this dessert is being served in ice-cream parlours all over Karnataka! Of course, for all the Krishna bhakts, Udupi stands for the Krishna Mutts, the most important temple in the centre of the city. This was founded by the Vaisnavite Saint Sri Madvacharya in the 13th century. The daily puja and the administration of this temple is managed by the pontiffs of the Ashta Mathas of Udupi [8 Mutts] on a rotation basis. This ritual called ‘Paryaya’ is also celebrated grandly. Each Mutt gets this privilege for two years. The Ashta Mathas in the city are Pejawara, Puthige, Palimaru, Adamaru, Sodhe, Kaniyur, Shirur and Krishnapura. Just 3-km from Udupi is the city of Manipal, a town with pubs, cafes and fashion. Manipal University is a respected University all over the world for imparting quality education and one can see lot of international students wandering around in that city. Absolute contrast to Udupi which in spite of being just 3-km from Manipal, is still steeped in myths, traditions and conventions. 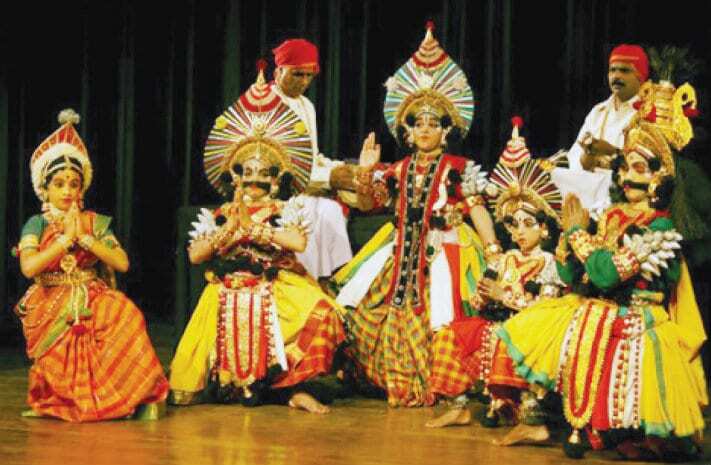 Yakshagana, a traditional dance-drama, performed from dawn to dusk, is still very popular. What is unique about this dance-drama? The music and the dialogue are improvised depending on the skills of the actor! Several families believe that they are protected by demi-Gods called bhoota and hence perform a ‘kola’ every year to appease them. The main dancer normally get possessed by the demi-God and starts acting like an oracle. Village/family disputes are referred and the oracle judgments accepted. Snakes are also revered and in rural Udupi, it is common to sight snakes slithering along the houses. The members of the household do not panic but they just go about their work as usual, on a snake sighting. Unlike the city folks who instantly call up Snake Shyam! Rural houses normally have Nagakatte and a Nagamandala is performed every year to appease this God too! It is not uncommon to see some men start writhing like snakes during this ritual. Udupi, a city with a separate dialect Tulu, is a paradox. Modern and at the same time ancient and ritualistic. Being a coastal city, it is humid and hence one tends to sweat a lot during day time. Just like Mysuru, Udupi too is centrally located in Dakshina Karnataka. 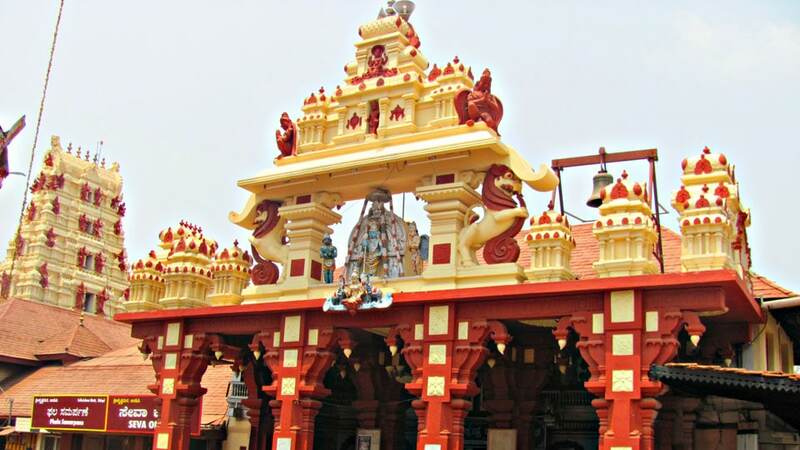 Surrounded by many a famous temples like Mookambika, Anegudde, Karkala etc., it is ideal to stay in Udupi and go visiting temples around this city. Excellent roads, transportation and hotels also. For lovers of the sea, one can visit Malpe, just a few kms outside the city. The city centre has hardly changed in the last 30 years but if one stands in the middle of the town near the temple, you get the feeling of a temple town. A must-see in anyone ’s itinerary for the sheer variety it offers. Sorry, I did not want correct or find fault, but just mention it is 180 degrees, not 360 degress..